​WELCOME TO THE 8TH GRADE QUARTER 1 PAGE! Welcome to the 8th grade quarter 1 page! It is here that you will find updates about what is going on in your child's art class. There will be photos, explanations, links to pinterest pages and artist websites and more! Make sure to check back here for an update on what we're up to! For a brief overview of 8th grade art, click on the homepage! JR began this Inside Out project by visiting communities around the world that he had heard about in the media. He would travel to these locations to hear the stories of the community members and help to spread their stories to the world, things they cared about, things they stood for - he would spread these messages by taking their portraits and printing them large scale and pasting them in different locations in the community for the public to see. The media would question...what's going on in that city? people pasting portraits? who are these people?...But then JR would leave and the media would have to come directly to the community to figure out what was going on and they would have to talk directly to the people in the portraits and those people would then get their stories told and heard by everyone around the world. JR was working to change lives with the help of his art, it was amazing. He has a very inspiring Ted Talk, you can watch it here. We showed this ted talk to the 8th graders and they too were very inspired. So, for their first project, we have asked the 8th graders to put themselves in JR's shoes, come up with a statement....I stand for......something they care about, and create a digital art piece using their own photography to spread that message. Students have had a few classes now to explore the photo editing programs and apps that we will be using. Before we jump into this project, we have assigned a few practice projects to get them used to the programs and ideas behind this project. First - we asked them to create a digital art piece in which they choose a piece of religious art, from any religion, and combine it digitally with at least 2 other layers of their own photography. This project is relating to what they are learning in history currently. We also have introduced some photography skills to the students as they begin to take photos. Then we created a class tumblr page (basically a blog page) which can be found here - we will use this page to upload photos that the 8th graders are taking outside of school, they will also add their finished pieces here as well. Please make sure to check it out so you can see the kinds of things they are making with digital art. Mostly the ones up right now are practice projects so students can learn the tools of the programs. In addition to that practice project, we also wanted the 8th graders to practice using the idea of layers with mixed media processes like collage. We asked them to create a square layer piece, a small piece of artwork in which they explore the use of layers, thinking about transparency, opacity, hiding and revealing...they also had to find a photo, from a book, magazine, newspaper and manipulate it somehow and use it in the layered piece. Check out some examples below! 8th Grade students are naturals with this digital project - they used either and sometimes both digital programs - Moldiv on the iPads and Pixlr on the desktop computers! They chose a statement that they stand for, something they care about and believe in and had to make a digital piece using their own photography to express that topic. They had to use multiple layers and use some of the photo techniques we discussed in class! Check out some of the final products below! 10/7/16: Starting our next project...Installation art! Students have been introduced to installation art - artwork that is installed in a site specific location and is many times in a public place so it can be accessed by more people! Students are working in groups to choose a word (the last word) that describes their time in middle school or their time between being a 6th grader and 8th grader. We are calling this project the last word project, once groups have chosen a word, they will begin to plan materials and locations for their installation. Check out some groups plans so far! 10/11/16: Installations are beginning to come to life! Students this week have begun really working on their installations - whether that is finishing their plans or collecting materials or actually starting to construct the installation! It is very exciting!! 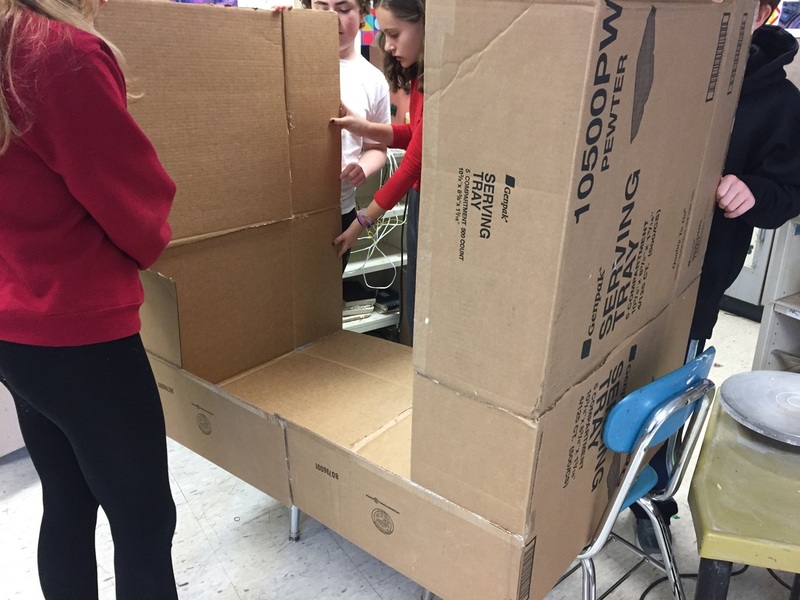 Check back for more photos of students working on their installations and in the meantime, check out this one group who has really started building and in one class period made some serious progress!! !